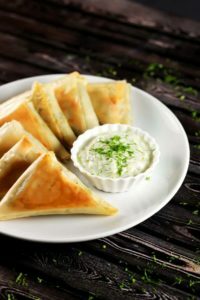 These Greek parcels (called Spanakopitas in Greek) are incredibly easy to make plus they’re baked and not fried! YUM! Healthy and absolutely delicious! These spinach and cheese parcels are so incredibly delicious – even if you’re not so much of a spinach fan! And the best thing is that they’re not even fried. 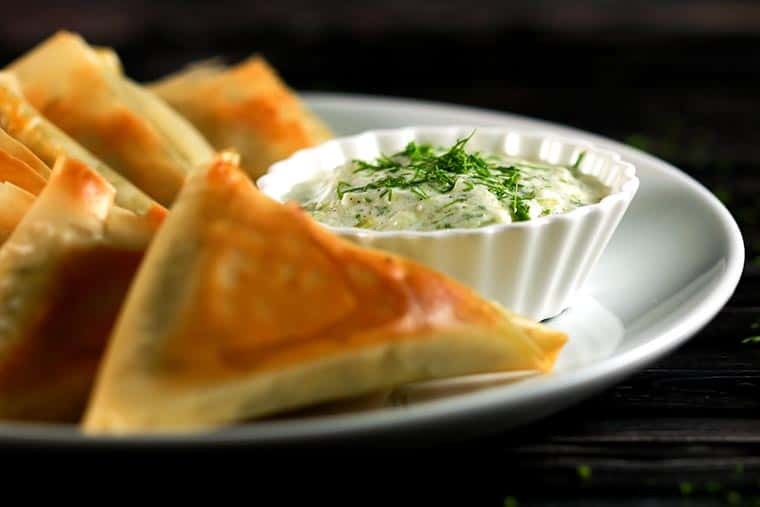 Pair them with this super easy tzatziki sauce and you have a delicious snack ready! The first time we tried the Spanakopita was when we made it during one of our culinary course classes. Although we’re both not that big a fan of spinach, we could literally not stop eating them! SO good. They’re very similar to samosas made all over the world except the slight difference in the pastry sheets. Nonetheless, they’re extremely easy to make and you’ll definitely make more of them after the first time. 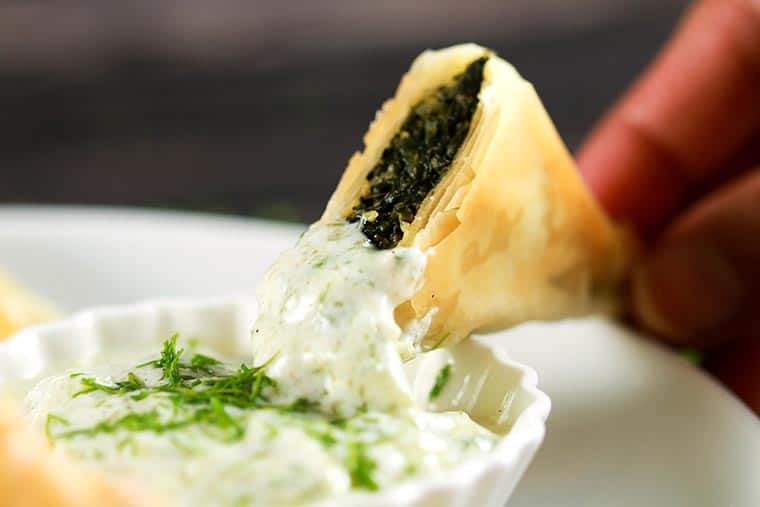 We’re trying more and more to explore recipes from different parts of the world and it was only fitting that we started with the Spanakopita for Greece. 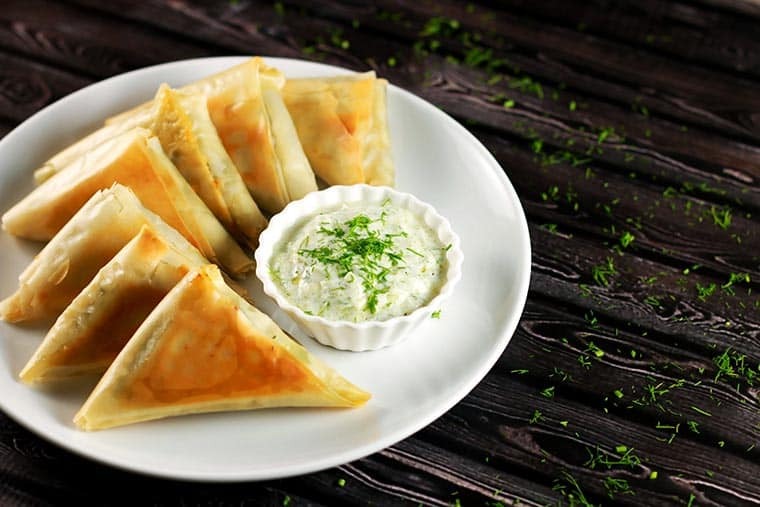 The tzatziki sauce is basically the icing on top for these delicious parcel. It’s so slight and summery, and goes perfectly with Spanakopitas. Feel free to add more feta cheese to your mixture in the recipe if you love it like us! Since these are baked instead of fried, they’re really good alternatives to the traditional samosa. Lets start with the recipe, shall we? 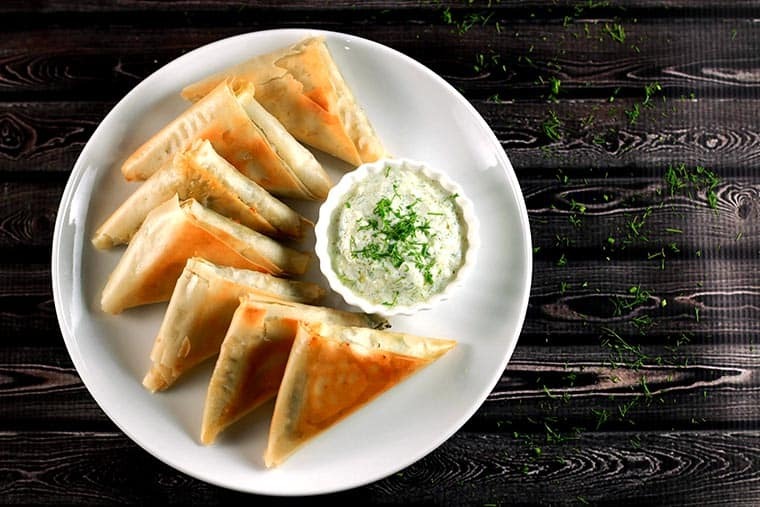 These Greek parcels are incredibly easy to make plus they're baked and not fried! YUM! Shredded spinach and chop the onion. Chop the garlic clove as well and set aside. In a pan, on medium heat, heat the oil and saute the onion and garlic till they turn slightly golden-brown (about one minute). Add in the spinach and cumin into the pan. Cook till the water from the spinach evaporates. Keep stirring the spinach so it doesn't burn. This should roughly take about 7 - 8 minutes. Once done, remove from heat and let it cool. Add the feta cheese to this spinach mixture and mix thoroughly. Cut long strips of the filo pastry - about 2 inches wide. Brush one pastry sheet with olive oil and place another sheet on top of it. The oil will make them stick together. Place about 1½ tablespoons of the spinach-feta mixture on one end of the sheet and keep folding it into triangles till the end. Seal the end with olive oil. Repeat steps 7 and 8 till all the mixture is used. Lightly oil a baking tray. Brush olive oil on to each Spanakopita parcel and place on the tray. Bake for about 10 minutes - or until they turn golden brown. Grate one cucumber and squeeze out the juice. Add this grated cucumber to the yogurt, along with lemon juice, olive oil, chopped dill. Liked this Greek recipe? 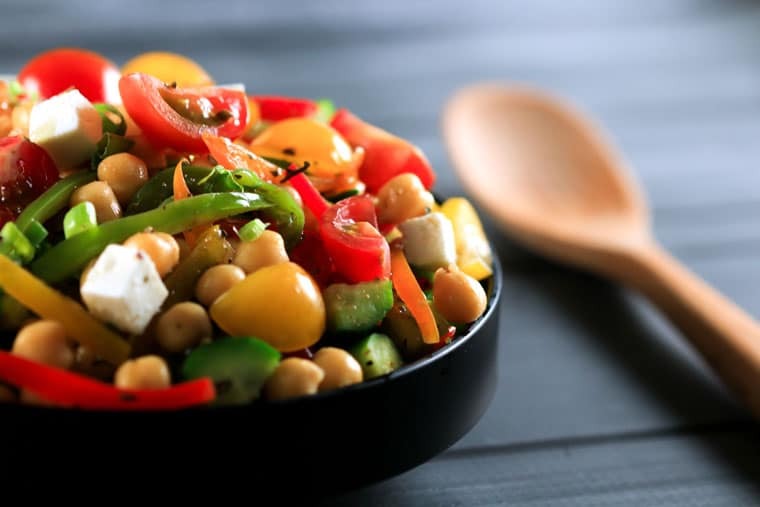 Then you’ll absolutely LOVE our Greek Chickpea Salad! 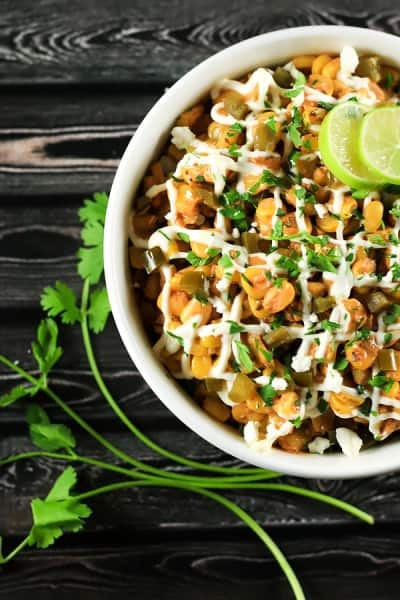 This salad has a certain balance that comes from this particular combination of vegetables that you just have to try to know for yourself! YUM!! Very interesting writes superb photos and easy to follow recipes I love your blog. Loved your blog. Superb pictures, easy to follow recipes and interesting writes! These look amazing, does anybody know if they’ll freeze okay? Should I freeze before cooking or after?